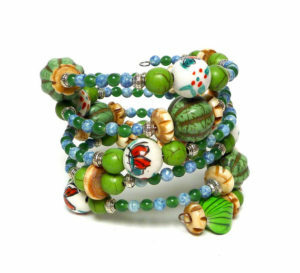 This bracelet called “Butterfly Faves” has a folk-art kind of feeling. If your style leans toward eclectic, this bracelet has a home on your wrist. For the month of September, bracelet sales benefit Forever Loved Pet Sanctuary in Scottsdale, AZ. They rescue senior pets from the Maricopa county shelters. The lucky dogs will either live in forever foster homes or be adopted. Thank you for saving the seniors!